Diamond Rebel. Fire Magic. Hissy Fitz. Edge of Joy. With varietal names like these – and with an endless array of colors, shapes and sizes – is it any wonder gardeners flock to dahlias? From dainty round pom poms to massive “dinner plate” blooms measuring a foot or more across, dahlias are as striking as they are unique. But as it turns out, appearances can be deceiving. “They’re really not that difficult to grow once you figure it out,” says Rob Wells, who sells Alaska-grown dahlia tubers and cut flowers as The Persistent Farmer. Both Wells and Morrow say there’s not much to growing dahlias as long as gardeners follow a few basic guidelines. Like potatoes, dahlias grow from tubers. Morrow and Wells both start their own tubers – hundreds of them – indoors in March. “Because dahlias take an absolute minimum of 70 days from starting until blooming, because of our climate, it’s really necessary to start them in advance – assuming you want blooms before September,” Morrow says. Her family dedicates an entire room to shelving and grow lights for their dahlia starts, while Wells offers a starter service: For $5 per plant, he’ll start your dahlia tubers for you and have them ready for pickup at planting time. Dahlias don’t tolerate frost, so don’t plant too early. The Morrows usually get planting around Memorial Day. 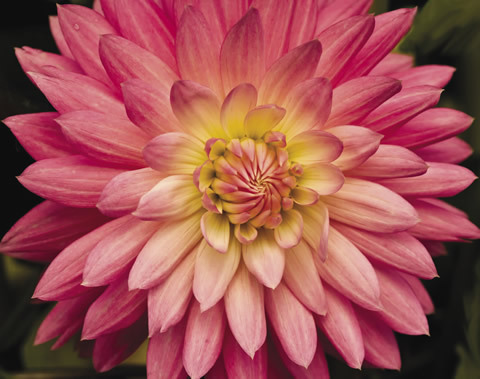 Dahlias thrive in full sunlight and well-drained soil. “The sunnier spot you can give them, the happier they’re going to be,” Morrow says. They don’t like wind, so Morrow strongly recommends planting with a sturdy stake and tying early. She adds a bit of fertilizer at planting time but doesn’t fertilize again. Both gardeners caution against overwatering. “When that top layer of soil dries out, people want to water. They get anxious,” Wells says. “The tuber tends to rot, and it’s game over.” The tuber, he adds, provides most of the nutrients the plant needs to thrive. Later on, Morrow recommends pinching out the center, or “terminal,” bud on each plant. For sheer garden drama, few flowers steal the show like dahlias. A big part of the flower’s allure is the seemingly infinite variety of blooms available. Still, when many people think of dahlias, they think of “dinner plate” blooms – the large, showy dahlias that can be as big as 14 inches across. 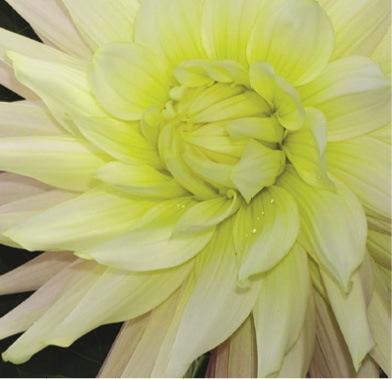 “Dinner plate” isn’t a variety of dahlia, but a size classification, and any number of varieties come in the large size. 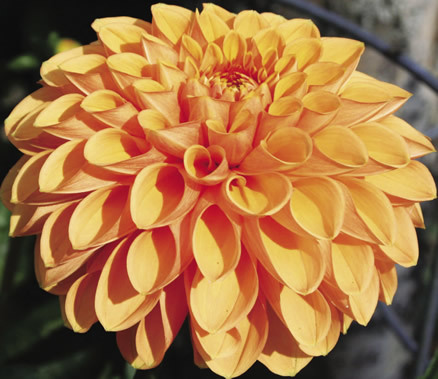 For big blooms, look for dahlia tubers labeled with the classification A (eight to 10 inches) or AA (for blooms 10 inches and up). 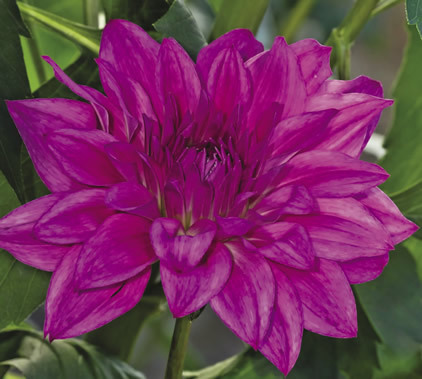 Giant dahlias are indeed real attention getters, but don’t overlook the profuse blossoms of the smaller varieties – some as tiny as a button. At the end of the season, dahlia devotees dig up their precious tubers to store over the winter. “Every grower has their own little techniques,” Wells says. He cuts his plants about three inches above the surface of the soil and, if there’s time before it snows, lets them sit for a day or two. When he digs, he makes a large hole a few feet across to keep from damaging the tuber cluster. Wells divides the clusters into individual tubers and packs them in vermiculite to be stored in a cool environment, between 35 and 42 degrees. Other gardeners use sawdust, plastic wrap, newspaper or sand to pack their tubers. At the Morrow house, they seal each in an individual plastic bag and store them in a cool bathroom. Basically, Morrow says, do whatever works for you.